Cricket (# ) (1858-c. 1900), 100-foot shallow-draft wood-hulled steamer built in San Francisco and used primarily to shuttle passengers and cargo from deep water ocean ships through the shallow San Pedro Bay to the Banning wharf in Wilmington. 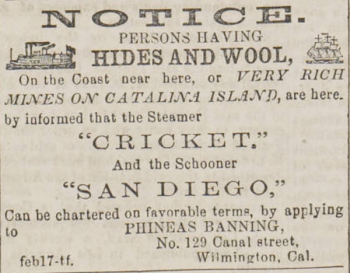 In 1878 Cricket was refitted as a luxury fishing yacht, and purchased by Phineas Banning in 1883 to shuttle passengers to Santa Catalina Island in a trip that took about four hours. In 1884 the Banning family incorporated the Wilmington Transportation Company formed a number of years earlier. Cricket sank off San Pedro after the turn of the century. This page was last edited on 4 September 2017, at 16:54.